Simmer chicken in water until fully cooked. Simmer okra until tender, drain, and reserve. Make a roux by whisking butter and flour. Saute onion, bell pepper, celery, and garlic. Add in okra, tomatoes, and sausage. Simmer herbs, cayenne, salt, pepper, and water. Turn off heat and stir in filé powder. How do you thicken gumbo with a roux? For this recipe, a dark brown roux is made with butter and flour to give richness and a deep toasted flavor. Roux is a classic French technique used as a thickening agent in soups, stews, and sauces. The roux is a mixture of equal parts fat (animal or vegetable) and flour. 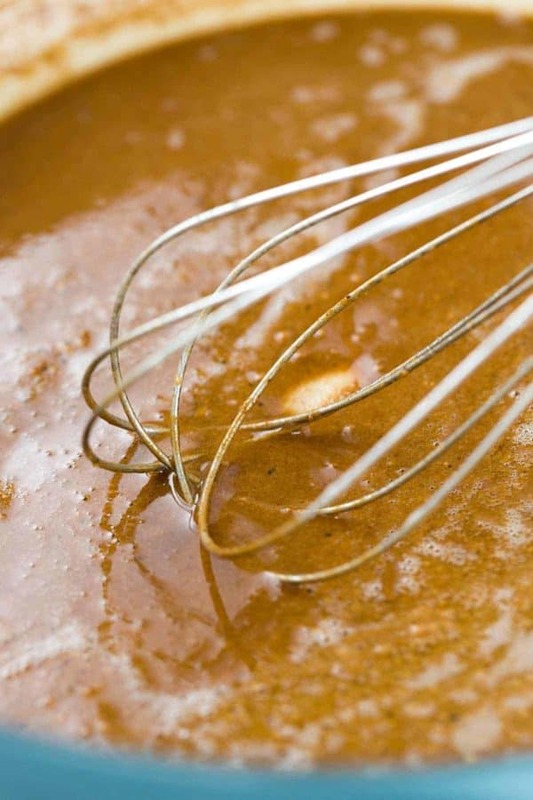 There are different types of roux based on color as it cooks; white, blond, brown and dark brown. A general rule of thumb is the lighter the roux, the higher the thickening power, but the least amount of flavor. What is the holy trinity in Creole and Cajun cooking? It’s a combination of bell peppers, celery, and onion. It’s a Lousiana inspired mirepoix and it adds beautiful aromatics, color, and flavor to the gumbo. Depending on the dish, various ratios and amounts are used. What makes gumbo unique compared to other soups? 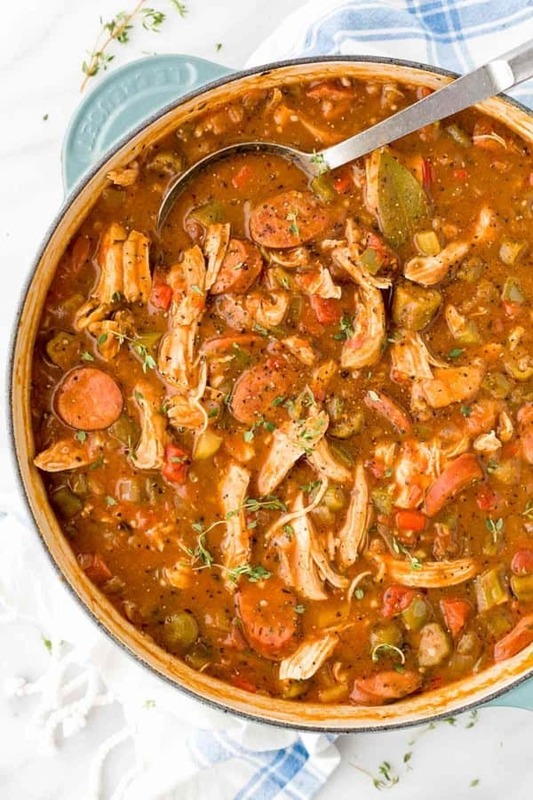 A dark roux base combined with other thickening ingredients like okra (use pre-cut frozen okra if fresh is not available) and Zatarain’s gumbo file provides the characteristic gumbo taste. Adding in dried thyme, basil, bay leaf, basil, cayenne pepper, and smoky Aidells Cajun andouille sausage gives it layers of flavor and a spicy kick that is distinctive in Creole cooking. Are gumbo and jambalaya the same thing? 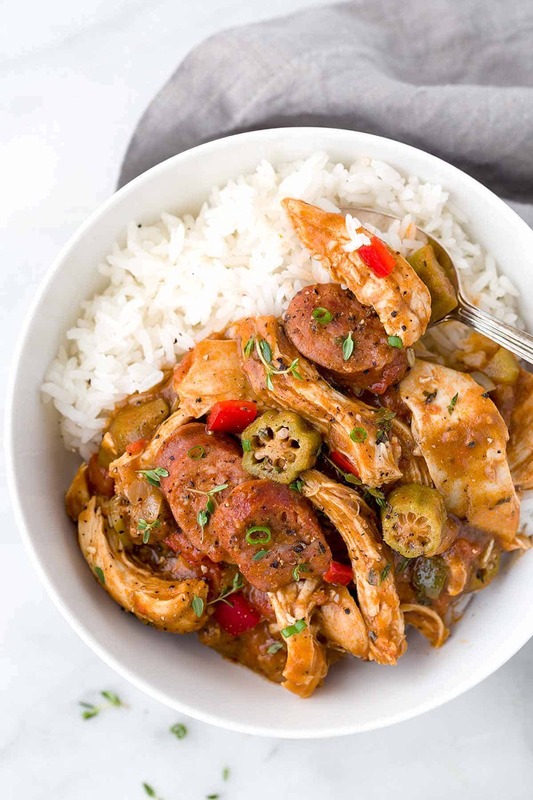 No, gumbo is a hearty soup or stew inspired by the French bouillabaisse and named after the West African word for okra “guingombo.” It can be thickened with a dark roux, okra, or file powder, or a combination. Rice is served on the side with gumbo. Jambalaya is rooted in Spanish influence from paella, it’s a rice-based dish simmered with various vegetables, meats, and seafood. In different parts of Lousiana, the style of gumbo can differ. The southeastern region can be seafood based with tomatoes. While the southwestern area can be meat-based with chicken or andouille sausage and thickened only with a roux. Also, some folks just serve the gumbo file on the table instead of cooking with it. What do you serve with gumbo? I always make some fluffy steamed white rice to serve with the stew to make it a full meal. Whipping up some freshly baked cornbread muffins is another tasty option. It’s hard to resist not gobbling up the whole pot, but trust me, the taste gets even better with leftovers the next day. Make sure that when you’re cooking this, turn on some New Orleans Jazz and “let the good times roll (laissez les bon temps rouler)” in the kitchen! What is Gumbo File Powder? You will see this unique ingredient in many gumbo recipes from Louisiana. File powder is sassafras leaves that have been dried and ground into a fine powder. It is used to thicken gumbo just before serving. In a medium-sized pot, add chicken breast and thighs and cover with 2 quarts of water. Bring water to a boil, then simmer until fully cooked about 20 to 25 minutes. Remove cooked chicken from pot, allow to cool, then shred into small pieces. Cover and set aside. In a medium-sized saucepan, add okra and ½ cup of water. Bring to a boil, then reduce heat and cover. Simmer for 7-9 minutes until tender, stirring occasionally. Transfer okra to a colander, drain, then reserve. In a large pot, combine ½ cup unsalted butter and ½ cup flour. Cook over medium heat, frequently stirring with a whisk to make a dark brown roux, about 15 minutes. In the last 5 minutes make sure to continuously stir so the roux does not burn. Add onion, bell peppers, celery, and garlic. Sauté until vegetables are tender, about 8 to 10 minutes. Add cooked okra, tomatoes, and sliced Andouille sausage. Cook for 10 minutes, stirring occasionally. Add bay leaf, thyme, basil, cayenne, pepper, and salt. Add 4 cups of the reserved water (from step 2), mix well. You may add more water depending on how thick you want the gumbo. Simmer over medium-low heat, for approximately 30 minutes with pot loosely covered, stirring occasionally. Add cooked shredded chicken and simmer an additional 15 minutes. Turn off heat, and slowly stir in the gumbo file. Do not reboil after adding as this tends to make the gumbo stringy. Taste and season with more salt and pepper as desired. I tried this yesterday and it was so delicious! Thank you for the recipe, definitely staying in my back pocket! I made this dish night awesome recipe thank you. Love gumbo, but have never made it. This recipe certainly looks doable. 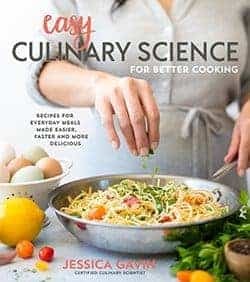 I was always hesitant to try because of the ‘fails’ I’ve seen in the past on various cooking shows and every recipe I’ve looked at seemed crazy complicated. If I am unable to find file powder, would cornstarch be a good alternative? Or is there a favour to file powder? Hi Robin! Great questions! If you can’t find gumbo file in the stores, then you can definitely order it from amazon. The file powder adds a unique earthy flavor and some thickness right at the end. I would say that if you don’t use it, just cook the gumbo a little longer until it reaches a nice stew consistency. There already is a flour based roux thickener and okra so I don’t think it would be beneficial to add cornstarch for extra thickness. I know you can do it! There is a video that I just created for the recipe so you can see all of the steps! My wife is Cajun and we grew up in SE Texas close to LA Cajun Country. Making a roux is easy but a little bit time consuming so don’t worry about it . It’s only 1/2 oil and 1/2 flour and the longer you cook it at low heat the darker and stronger it gets. After it gets to the color you like just add water to get it to the thickness consistency you want and add the Trinity. You can add almost any meat, or no meat. Serving it with rice is a must. BTW adding tomatoes is N.O. Creole, not Cajun. You can add file for added flavor but it’s not necessary for thickening. Instead of adding water to the flour and oil I add stock from the chicken so as to keep the flavor. If there’s not enough stock I use chicken broth. For me, adding water does not enhance the flavor. I don’t know if it is my imagination or not, but I think adding sage gives a suggestion of file. And for thickening, just add more okra. I used to live in NOLA for undergrad and loooooved gumbo because of the city. This one you made looks so hearty and delicious. I think it would totally bring the whole neighborhood to your house ready to eat lol! Great post! Made this yesterday and we loved it! Not a fan of okra so I skipped it. Also used 1/2 andouille and 1/2 regular chicken sausage to be sure it wasn’t too hot for the first try. Can’t wait for the leftovers! Thank you!! I made gumbo last night. After about 40min my roux was the color of peanut butter- maybe my cooking temp was too low? But worth the wait because it turned out fine and even better today. Thanks for the recipe! Hi John! Sorry that your roux took so long, but it sounds like you perfected the recipe 🙂 Next time maybe try medium-high heat but keep a close eye so the roux does not burn. We Cajuns from south west Louisiana usually put the file on the table so each one can use as much or as little as they like, or none at all. And it is not used just as a thickener. It is more for taste. The roux takes care of thickening. I appreciate your feedback Gerry! Great idea giving your guests the option to add as much or as little file as they desire. That’s exactly what I’ve always done(since ’87) when using file powder. Here in Tennessee, I put it on the table to compliment my seafood dishes. It adds a great flavor. I put the file on the table also. I was wondering if when you calculated the nutrition on this that you included the steamed rice or if the nutrition listed is only for the gumbo itself. Just trying to track what I eat. Thanks! Hi Taylor! The rice is not included in the nutritional information. Thanks! I love this recipe! I never have given a review before, but this is worth my time. Took a while when you include prepping, but my husband said it was worth the wait. Love it. I’ve made this before and it was amazing, but I’m wanting to add shrimp this time…when do you think I should add this in the recipe? Thank you for your feedback Casey! I would add it right after the chicken simmers in the last step and cook until the shrimp are cooked through, should only take a few minutes. Then turn off the heat and add the cumbo file. My family is gluten free so I took a chance and used garbanzo flour and ghee to make the roux. It turned out wonderfully! Everyone loved it. Great recipe ???? Thank yous so much for your feedback Melody! I love the gluten free substitution, I will definitely have to try your version. Cheers! Great recipe! So easy and yum! I made this last night and it was delicious! I added a bit of Tony C’s for even more flavor. Will definitely make it again. Thank you!!! Last night we had a taste of New Orleans in the middle of Greenwich Village. Excellent recipe and thoroughly enjoyed by my guests. I made this today and it’s amazing! Authentic New Orleans Gumbo. I used a rotisserie chicken instead of cooking my own and chicken broth instead of water. Will keep this recipe forever. My wife and I got back from NOLA Sunday morning. Loved the gumbo so much, that I’m making it as we speak for a dinner party tomorrow. Paired with some corn maque choux. And hurricanes of course. So if I’m serving this tomorrow, I suppose I should add the file when I reheat. Our whole apartment smells fantastic. Thanks for sharing! I have made this 4 times since you posted it, both with and without okra. This posted recipe made me 🙁 as a LousyAnna resident who considers Gumbo making a form of Art. Boneless chicken? Any chef will tell you meat cooked off the bone is always less flavorful. Stick the whole chicken in the pot while you make your stock, with garlic,carrots,onions,parsley. Maybe some tasso. A butter roux is ok, but you really want a dark chocolate colored roux for chicken and sausage gumbo; which really is better achieved with a cajun vegetable oil and flour roux made in a cast iron dutch oven. I made this for my Southern parents and siblings and it had rave reviews from all. I couldn’t find my regular “go to” gumbo recipe and looked online for another. This sounded a lot like my old recipe but yours was even better. This will be my new gumbo recipe from now on. I made this yesterday and very glad I did. The taste was excellent, not too spicy but just enough. I used canned chicken and chicken broth in place of the water. I don’t know if I lost any flavor but it was excellent. I will definitely make this again. I couldn’t find gumbo file so I used arrowroot instead and it turned out amazing! We make this once a month and our family and absolutely love it. Thank you for a great recipe! Would it be all right to use self rising flour if out of all purpose flour ? Hi Teresa- I would not recommend using self rising flour since it has leavening agents in it and may make the gumbo taste a different. Great question! I found this exact recipe (word for word) in “Chef’s Secrets from Great Restaurants in Louisiana”, 1984. This is recipe was provided by The Gumbo Shop restaurant in New Orleans. I’m making for the first time. Hope it’s a good one! Jessica, is this your source? The proper thing to do is to give credit when do. Just saw your post above. Looks like this great recipe has longevity! Hi Liz- The reference to the recipe is in the notes section. It’s an old book that I received from my father-in-law which was mentioned in the post. Thanks! I made this recipe a few days ago and it is fabulous!!! I’ve been eating it everyday since!! I used chicken breasts and left out the gumbo file and it’s perfect! I’m from New Orleans and this is very authentic and close to some of New Orleans’ finest restaurants!! I made this gumbo recipe that I found on Google and it turned out to be yours! It was my first time making it and it was so delicious! Thank you for sharing it! I will be making it again! We didn’t like it. It looked promising, looked exactly like yours just not for us. We usually use a recipe which is a British take on Gumbo over here but I wanted to try this to say we’d tried an authentic recipe. Sadly we prefer the unauthentic one. Not sure what it was, I think maybe the texture of the sausage and the texture of the okra. Plus we prefer the kick of cajun in our british version. We really wanted to prefer the authentic recipe but unfortunately not. It looked and smelled amazing though just not to our taste. Hi Victoria- I appreciate your feedback and willingness to try something different. I am curious about your British version! If I want to add shrimp to this gumbo how and when do I do it. Thanks! I would add the shrimp during step 12, 5 minutes after you add in the chicken. Simmer until shrimp is fully cooked. Blain Sonnier: Disagree, and I grew up in New Orleans. Cajun gumbo does not have tomatoes, but Creole gumbo does. Both are delicious, but I prefer Creole style. Absolutely, l’ve seen it all. From tomatoes to corn. Wow! I put shrimp in mine too. Delicious. Everyone loved it. I made this about a month ago. Everybody loved it. Doing it again tonight. I’m adding shrimp, precooked and shelled right at the end. I’ll get back to ya. This batch is almost done. Still have to add the chicken and I’m adding shrimp towards the end. Just made this dish and it was delicious! Our family is gluten free so I made the roux with cassava flour, which browned quite nicely. The recipe turned out great! Thanks for the tips on filé powder….I bought some in New Orleans and was not sure how to use it. Yay! I will definitely have to try the cassava flour, I’m so happy that you still had good thickening properties. I’m from southwest Mississippi so I have been to New Orleans serveral times as well as have many family members and friends that live in Louisiana. This is the first gumbo I’ve ever made and I’m 20! I’ve had my fair share of bowls and this recipe is yummy! I prefer it over my moms which I used to enjoy a lot. I even used a little of the left over drippings from the sausage in the roux and it still turned out great. Glad I chose this recipe and not others I found on the internet. This one seemed to be the most promising and it was. The 1 tsp of Cayenne was just enough for me, I do like spicy food, but I don’t want it so hot that I have to sip my drink 10 times while eating. Thanks! Wow, thank you so much for your feedback, Brittney! Coming from someone who grew up in Mississippi, this means a lot 🙂 So happy to hear you finally made gumbo! If I want to be able to reheat it the next day should I leave the file out? Hi Kate- Are you serving it the next day or just leftovers? To be safe, you can add the file the next day when you reheat and serve. Otherwise, I think the texture would still be ok if you add it in and then reheat. If you’d like, you can also add in a small amount the first day you make it, and add more later if desired. Hi Mary- I would still make the roux on the stove top, along with the celery, onion, bell pepper and garlic, and then add it to the slow cooker. Then you can cook the chicken breast with 4 cups chicken stock and other ingredients in the slow cooker until cooked through, and then add the okra in at the end of cooking and then the file. Loved this recipe! I followed all the steps but my Roux didn’t get dark brown, not sure what happened. I also added shrimp. Hi Jaclyn- you might have to slightly turn up the heat. Depending on the type of pot you use and thickness I’ve found that I need to adjust the heat up or down. Hi Jessica. Can’t wait to try this. Only question I have is what is a good substitute for Andouille sausage since I don’t eat pork? Hi! I want to use this recipe in a gumbo contest and I need to make 5 gallons. How much does the original recipe make? I saw 6 servings. Does that mean 6 cups? Hi Jennifer, how exciting! I would say 6 cups is a safe estimate. First time to make gumbo , i followed the recipe and it was good , Thank you for sharing . well my husband went back for seconds and then thirds! Haha! I highly recommend this recipe! Oh my god this was great I put shrimp in it. With cornbread to die for. I will be making it again. Jessica, I live in central Pa but was stationed in LA. Gumbo was my favorite part of that tour. The recipe is great and brings back memories. Instead of cooking the chicken on the stove I smoked a turkey and used it. Turned out great. Oh wow, George, smoked turkey sounds incredible! I’ll have to save some from Thanksgiving and make this gumbo. Are you able to freeze the final product and reheat at a later date? I made this yesterday and it is better the next day. Wow. I was intimidated by brick roux but Alton showed me a fool-proof method you might like. Oil and flour in heavy soup pot in oven 350° for 1.5 hours, lid off. This is my first gumbo ever and I’m 70! What fun. Just made this for dinner. Looks and taste fantastic! Ended up substituting Ro-tell for canned tomatoes as I didn’t have any on hand. Still turned out super yummy! Thanks for the recipe! Hi! I really want to make this for my family for Christmas. I have always been a little intimidated by the roux! But I am ready to try. I am just wondering how hard it would be to double? Can it be frozen? And…is there a reason why some roux recipes call for oil and some butter? Thank you! Excited to make! Hi Alyson- So excited for you to try making a roux! How many people are you feeding? This makes a pretty large batch. You could freeze, I would just wait to and the file before serving. You could use oil or butter for the roux, I like the taste of butter. Is it possible to just use black pepper instead of whole peppercorns? Hi Kelly! The recipe uses ground pepper and not whole peppercorns. Thanks! As with every gumbo recipe I’ve followed, the okra disintegrated. Thanks for your feedback Jeremy! Perhaps you could try adding it in at the end with the shredded chicken to hold its shape better. Are you using fresh or frozen okra? I made this today since I had some time to make it and it may be the best dish I have made from a recipe found online, it was outstanding and I wouldn’t change a thing, thanks for sharing such an awesome dish! The video helped too! I made this and made 1 1/2 recipe to have extra, My son and husband said they like it, then on their second bowl my son said t is his favorite thing I have made, I was very good. Can you substitute chicken broth instead of the reserved water? Yes, you can substitute chicken broth instead of water. Could I use a bag of frozen gumbo mix for the veggies? If so, when do you think I should add, and should I add frozen or thawed? 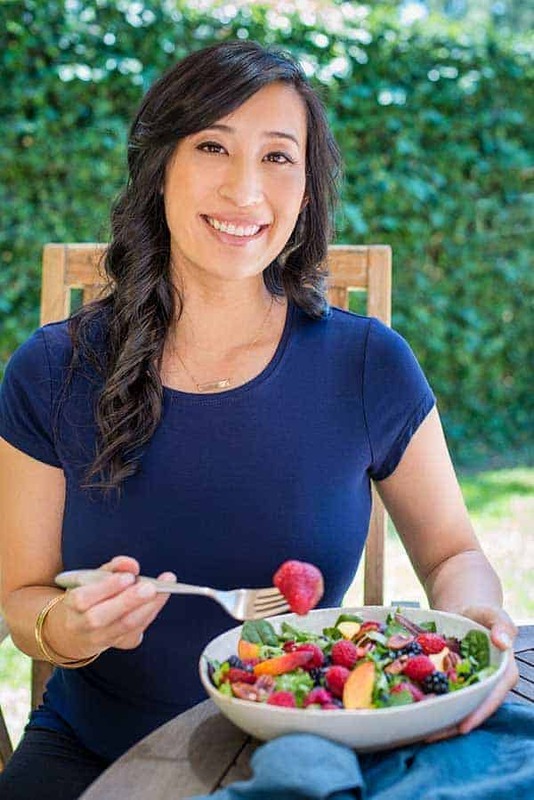 Hi Katie- Yes, I think you can use frozen veggies. You can add them frozen after making the roux. If you defrost them, then add them in at the last 15 minutes of simmering. This sounds delish! If I want to add crab legs, when do I do that? I would simmer the crab legs with the shredded cooked chicken (step 12). Why is there such a high salt content? What can be done to lessen the amount? The sausage will have added salt, but you can reduce the amount of kosher salt added to the recipe. Just taste the gumbo and add in as much as you’d like towards the end of cooking. Im making this recipe for my daughters Birthday tomorrow. Ive cooked it before but its been a few years. Thank you for the recipe and wish me good luck. Ill get back to you and let you know how it turned out. Thanks for sharing the recipe. I made this recipe yesterday to celebrate Mardi Gras & my hubs, three boys (8,7,5) and I all loved it! I served it in a bowl with rice and we barely have any leftovers! … I did omit the tomatoes, used bacon lard instead of butter, and added shrimp at the end (Shrimp shells & veggies were cooked in the chicken water to make a delicious chicken/shellfish stock!) 🙂 but I’m sure it’d have been delicious without any modifications at all! Thanks for the recipe! Made this yesterday, and what a great meal over steamed rice. I tried using just what was in the house so had to make a couple of changes: used hot Italian sausage in place of andouille, had a can of Ro-Tel tomatoes with habaneros and made up the difference with fresh tomatoes. Didn’t have gumbo file but used Tony Chachere’s Creole Seasoning in it’s place. Everything worked and was delicious. Will definitely make again! Thanks for the recipe. This is very similar to my own recipe, which I borrowed from Cajun Bill of Opelousas, St. Landry Parish, LA. I think Bill uses Savoie’s Roux in a jar. I make mine from scratch, but I clarify the butter first. Ca c’est bon! Can you substitute turkey for the chicken? Yes, turkey breast, thigh, or drumstick would work instead of chicken. Made this gumbo tonight and my whole bunch LOVED it. I used chicken broth instead of the water, cajun spice at the end since I couldn’t find the filé. And i also threw in a lb. of shrimp about 5 mins before the end of cooking time. It was so great!!! Thanks for posting this. It will be a staple on our menu wheel here from now on!! Thank you for sharing your experience and substitutions Crystal! I’ll have to try the shrimp next time.